Amount of time devoted to this DS game in the last week--Seven hours, 23 minutes. Most recent boss toppled, location reached or milestone achieved--Defeated Bullhead in Agata Forest. Overall comments on the experience--Although I've been keen on the Okami series (if such a thing can be said to exist) since it debuted in 2006, I'd only ever spent a handful of hours with the original PS2 title before I booted up Okamiden for the first time last weekend. That rather anemic playthrough took place a number of years ago, though, and I can only barely remember it today, so it may as well be said that I came into this DS follow-up with fresh eyes. A week later, I'm flogging myself for failing to tackle the game earlier. 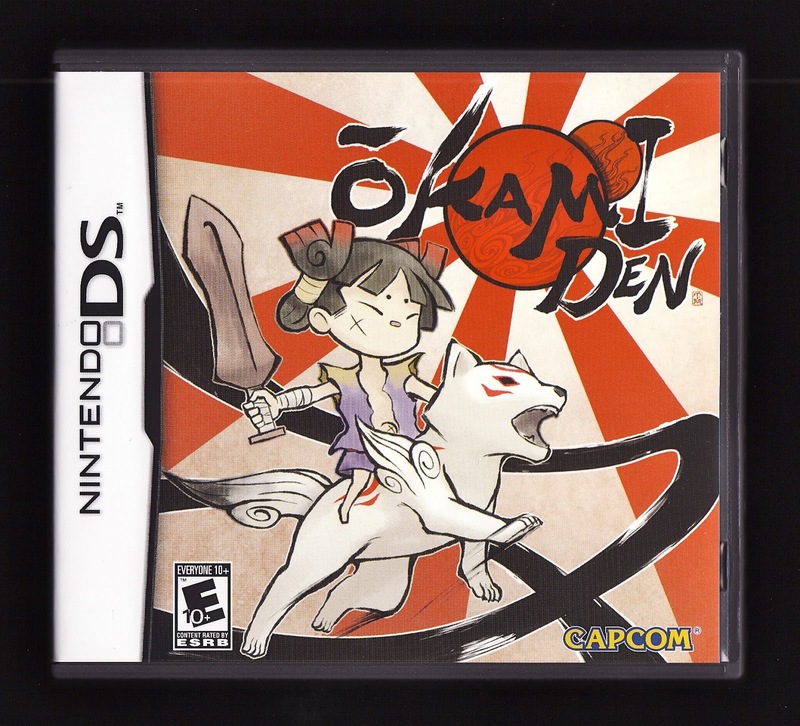 Admittedly, it features a decent number of flaws--a dodgy frame rate, some oft-awkward controls and disappointingly constricted play fields among them--but on the whole, Okamiden offers up a rousing and beautiful adventure that's more than the sum of its parts. 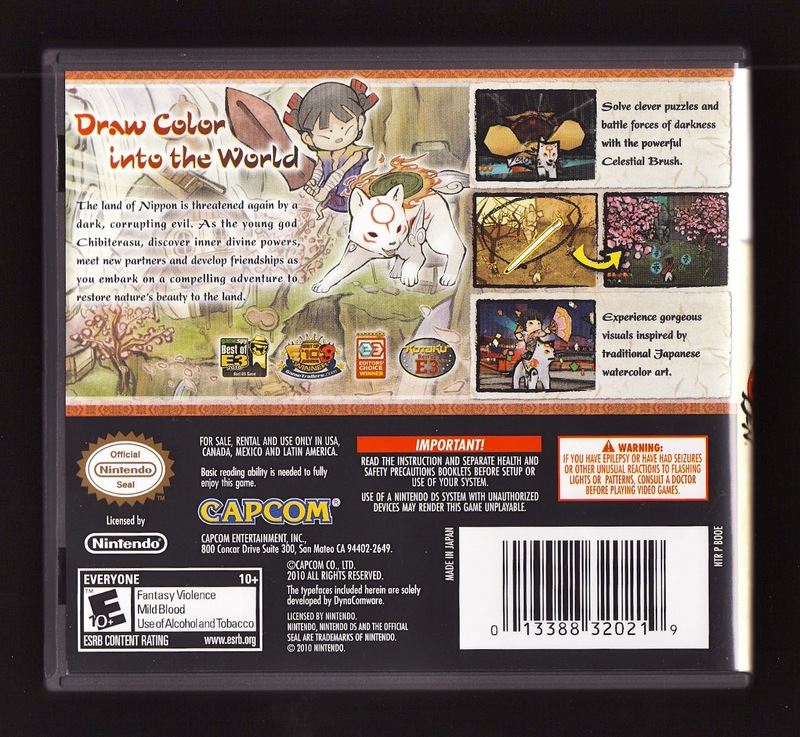 It would be easy (and kind of lazy, too) for me to say that my favorite of Okamiden's many "parts" at the moment is its art style--which is, without a doubt, pretty darn stunning. In reality, though, the game's aesthetics are at least matched in my mind by its story and boss battles. The former can seem a bit trite at times, actually, but for whatever reason I've more often than not found it sweet and even touching. As for the latter, they almost always overstay their welcome, but they're also inventive and interesting--or at least the one's I've experienced so far have fit that bill. Another highlight: getting to know and use the "Celestial Brush" that serves as the centerpiece of this portable, Zelda-like offering. Sure, the game's often a bit too willing to spell out for players when and where to utilize these stylus-enabled symbols, but thankfully that rarely seems to dent the unique appeal this gameplay element brings to the proceedings (especially the battle scenes, which otherwise would feel simplistic and repetitive). Will I continue to play this game in the coming days, weeks and maybe even months?--Definitely, and hopefully all the way through to the end credits. Do I recommend it to others?--Yes. Some may find the art style to be disorienting or even off-putting, but they're the only folks I'd even think of dissuading from playing this game. I hope you stick with it, in my opinion it is only getting better from now! Linnea! Nice to hear from you again ^^ Also, thank you for the comment. I'm glad to hear that you, too, enjoyed Okamiden. And I'm guessing you would recommend that I play the original Okami sometime after I finish Okamiden? Oh yes! 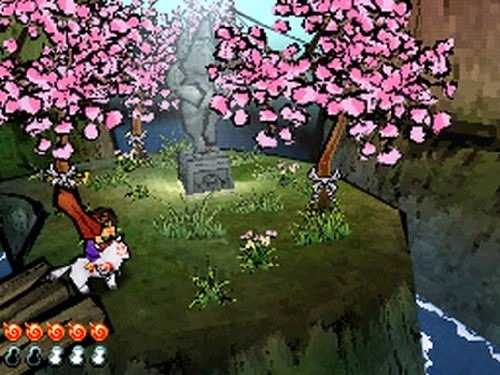 Okami is a very long experience though, so be prepared for stunning awesomeness! I did try the Wii version of Okami, but was not impressed with the controls. P.s Are you playing Okamiden on a 3DS? If so, is the analog pad working well, or is it at all? That's good to hear! I probably won't attempt Okami for some time, as I'm going to need a bit of a break, you know? I'm sad to hear you didn't much like the Wii version, though. Oh, well, I already have the PS2 version anyway! Oh, and I'm playing Okamiden on my 3DS XL.Unfortunately, using the analog pad doesn't alter or improve the controls, although it is what I'm using to play the game. Oh, I see! I have still not tried a 3D style game from the DS on my 3DS. I am so curios about how a Wii U Okami ( a sequel) would turn out. That would be so awesome. As for using the 3DS' analog pad for DS games: it's more comfortable for the hands (than using a d-pad), for sure, but it doesn't actually add analog movement to any games, as that is something that has to be programmed in from the start. I'll get to Okamiden one of these days, but i really want to finish Okami first. Btw, if you ever get back to the first Okami, it's not *that* long of a game, but it feels like it has 2 of its own sequels built in. It really feels like you've played a full game and you've beaten the final boss when you're really about 1/3rd-1/4th of the way into it. 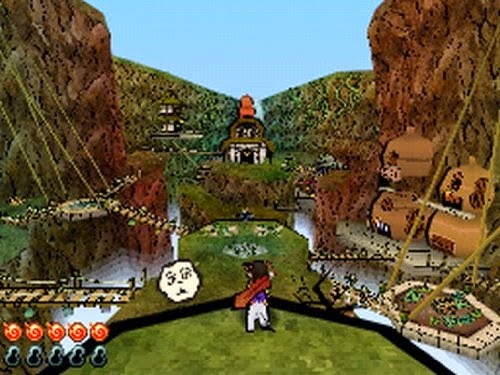 Oh, there's no question I'll get back to Okami at some point, finchiekins, especially since others have reminded me that Okami's locales seem more open than those in Okamiden. Also, your comment about Okami's length has me wondering how far I am into Okamiden at this point. It *feels* as though I'm still in its first half, but what do I know? Glad you're enjoying it. I agree with Finchiekins about Okami. It's...healthy. I finished the "final boss" and went, "Phew...that was awesome." And then I promptly learned I wasn't even half way. And it didn't really ever get dull. And the REAL Final boss fight? E. P. I. C. So good. Well, that's certainly nice to hear. I'll definitely have to wait a bit before re-tackling Okami, though--after I'm done with Okamiden, I mean. I'm going to need a break!